Thailand's government on Saturday displayed to foreign diplomats a huge cache of weapons it said had been confiscated from anti-government protesters, to quash criticism of a deadly crackdown. "Red Shirts" leaders, who mounted two months of rallies in Bangkok that saw clashes and blasts that left 86 dead and 1,900 injured movement, have criticised the use of force and said their supporters were unarmed. The government said that after Wednesday's final offensive which forced thousands of Reds to disperse and their leaders to surrender, it had found a haul of assault rifles, ammunition, grenades and crude homemade bombs. "Terrorists have used these weapons to attack officials and innocent people," said Suthep Thaugsuban, deputy prime minister in charge of security affairs, at an army barracks on the northern outskirts of the capital. "Although the protesters have always denied terrorism or possessing weapons, after the rallies dispersed we found a lot of lethal weapons," he told media and dozens of Bangkok-based diplomats and military attaches. Thailand's top forensic scientist, Porntip Rojanasunan, also said that four car bombs had been found around the protest site which paralysed Bangkok's top shopping district for six weeks. AFP journalists reporting at the protest zone for the past two months have seen only a handful of firearms in the hands of protesters, who were mostly armed only with crude weapons like rockets and Molotov cocktails. Wednesday's campaign was met with little resistance. Concern has been growing over rights abuses in Thailand, with the European Union the latest to call on Thai authorities to respect the rights of the protesters and saying the violence had harmed the nation. In a clear reference to the Reds' hero, ex-prime minister Thaksin Shinawatra, the army said that masterminds including those from outside the country were responsible for the mayhem of looting and arson that broke out after the offensive. "It's not true that protesters carried out arson attacks due to anger after protest ended. It was well planned and ordered by people outside and inside the country," said army spokesman Colonel Sunsern Kaewkumnerd. Thaksin was ousted in a 2006 coup and now lives in exile to avoid a jail sentence for corruption. 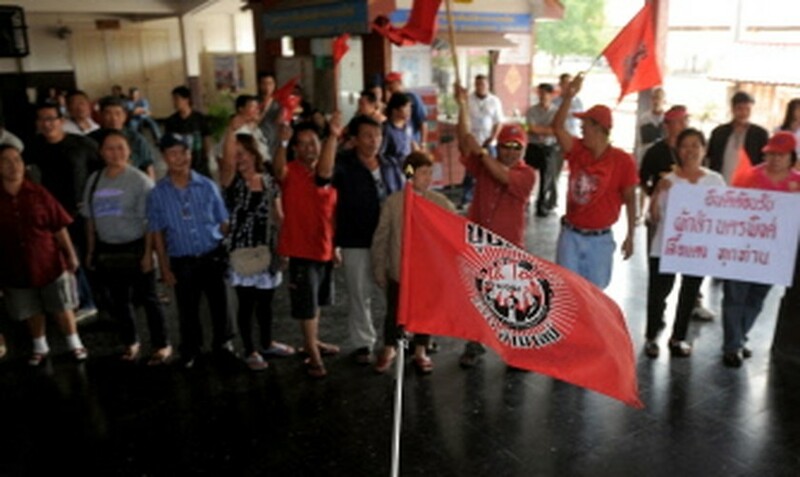 A curfew is in place until Sunday in Bangkok and most of the Reds' heartland in the north and northeast. Suthep said there would be an announcement Sunday over the status of the emergency measures.